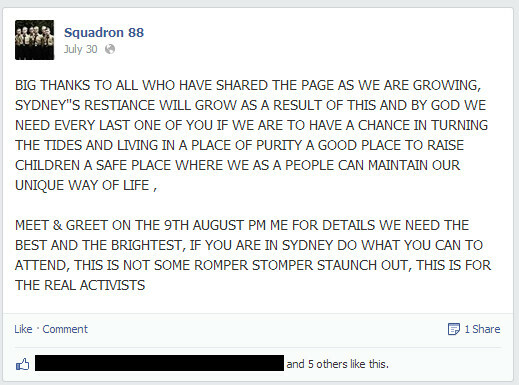 A small group of neo-Nazis, calling themselves “Squadron 88”, have again spread racist fliers through people’s mailboxes in Sydney. One set of fliers is similar in style to fliers a month ago, but this time targets “non white migrants”, the other is a new fancier antisemitic flier. 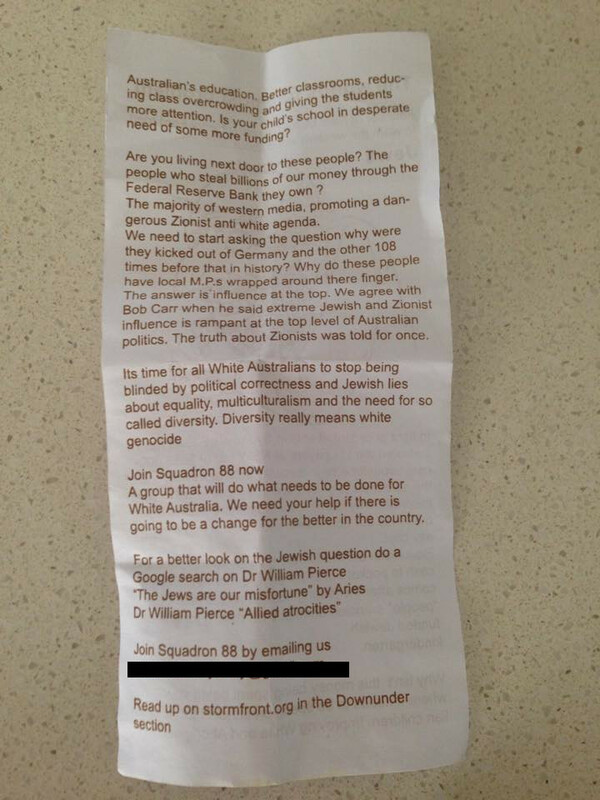 The fliers from “Squadron 88” have made local and international news and have been covered by The Sydney Morning Herald, News.com.au, SBS, The Australian, J-Wire, The Australian Jewish News, JTA, Algemeiner, RT.com, The Daily Mail, and others. The media attention is in part a result of the blatant disregard for the law which this small group have shown. 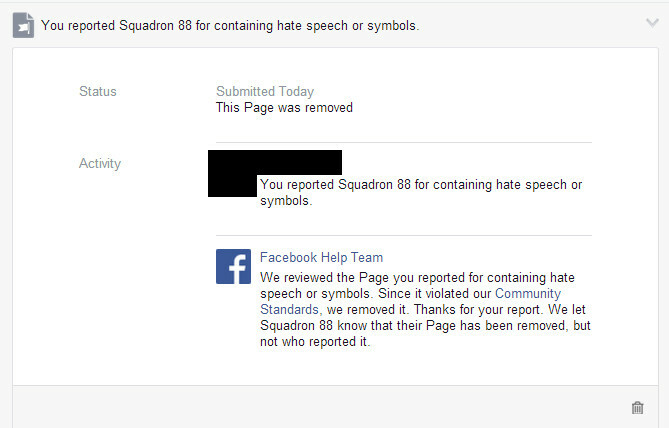 This briefing provides an analysis of the fliers, details of some of the response to them, and some background on “Squardon 88” and their online activities on Facebook and Stormfront. While their initial Facebook page was closed by Facebook last month, they now have a new one (created on September 22) with 2 likes. OHPI contacted Facebook to request expedited removal of this page, and we are pleased to report it has now been closed. The new Facebook page – and how to report it! The new antisemitic flier is titled of “The worlds foremost problem” [sic], which is the subtitle of Henry Ford’s “The International Jew”, the English language version of the Protocols of the Elders of Zion which first brought that antisemitic forgery to prominence in the United States and the English speaking world. The flier goes on to warn that Henry Ford tried to warn the world about Jews, and includes a picture of the “antisemitic meme of the Jew”, an image which the Online Hate Prevention Institute released a report on back in February. 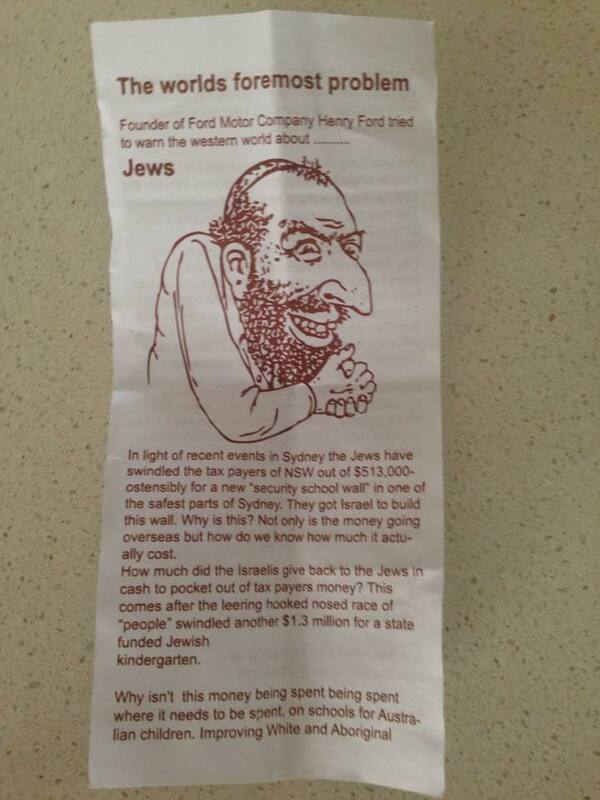 The flier claims “the Jews have swindled the tax payers of NSW out of $513,000” in reference to a grant for a new security wall to protect a Jewish school. It goes on to say “hooked nosed race of ‘people’ swindled another $1.3 million for a state funded Jewish kindergarten”. Beyond the promotion of Jews as hooked nose swindlers (such old antisemitic tropes they almost appear comical) this attack is designed to paint the Jewish community as “the other”. The flier goes on to ask why this money isn’t spent on “Australian children”, attending to strip Jews of their citizenship. The flier goes on to suggest the money should have instead been used to improve schools for “white and Aboriginal Australian’s”. 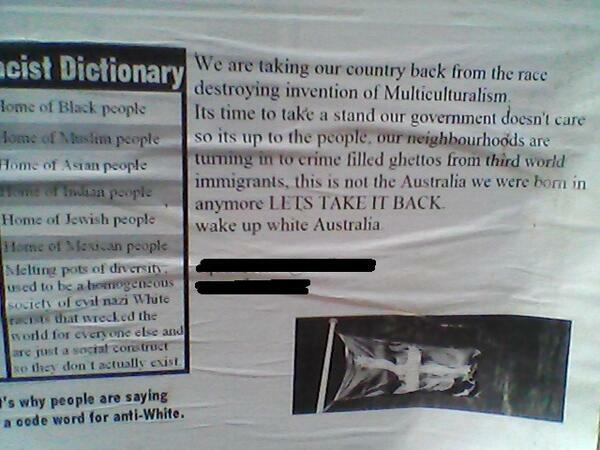 The reference to Aboriginal Australian’s seems entirely out of place in a white supremacist flier which goes on to reject ideas of “equality, multiculturalism and the need for so called diversity” which it describes as “Jewish lies”. The gratuitous reference to Indigenous Australians seems based on the realisation that Australia is not part of Europe, and the claims made by European white nationalists that immigrants are wiping out their “historic white culture”, just doesn’t work here. The flier goes on to transplant more American far right antisemitism with the claim that Jews are “people who steal billions of our money through the Federal Reserve Bank they own”. In Australia we don’t have a “Federal Reserve Bank”, our version is called the Reserve Bank of Australia. While the US Federal Reserve Bank has commercial banks as its shareholders, and pays them a dividend set in statute, in Australia the Reserve bank is a statutory corporation of the Government, it has no shareholders and all appointments to the board are made by Federal Treasurer of Australia. This antisemitic theme employed by the flier, why popular with American antisemites, simply has no relevance in Australia. The flier goes on to make a half hearted attempt at alleging Jews control the media saying, “The majority of western media, promoting a dangerous Zionist anti-white agenda”. It’s unclear what they are trying to do with this incomplete sentence beyond ensuring they didn’t leave out the “Jews control the media” canard. The flier also makes a passing claim that the problem is not antisemitism in society but the fact that Jews deserve to be discriminated against, it said “we need to start asking the question why were they kicked out of Germany and the other 108 times before that in history?” This argument was better developed in their previous flier from a month ago (discussed below). It should be noted that the reference to expulsion from Germany is most likely someone making a historic mess of World War II. Jews were not expelled by the Nazis, they were rounded up and killed. Of course a modern neo-Nazi is most likely also a Holocaust denier, which leaves them inventing an expulsion. Jews were expelled from Austria, and moved to Germany where they were welcomed, but that was in the 17th Century and it is unlikely the producer of the flier intended to reference this. Claims of Jews controlling government are also present with the flier asking “why do these people have local M.P.s wrapped around their finger. The answer is influence at the top.” On the plus side they left off the scare quotes they used earlier, the previous use of ‘people’ in quotes suggested Jews aren’t really people, an effort at dehumanisation. This time Jews are portrayed not as less than human, but as superhuman, with great power and influence. While antisemitism can take either form, the mixing together of both on one short flier is amateurish. The reference to ‘local MPs’ is also interesting; all MPs are the local MP for their electorate. This use of language is likely a reflection of media commentary which often seeks comments from the local MP for an area which has been affected by racism. It may indicate a lack of understanding about the Australian electoral system. The reference to Bob Carr and his statements highlights exactly why the Jewish community has been concerned with various things Bob Carr has said. These statements feed antisemitic groups like this and a former Premier and former Foreign Minister should not be making statements which inflame racism and can be used as fodder by neo-Nazis. The flier then introduced Squadron 88 as “a group that will do what needs to be done for white Australia”. This vague phrase, combined with the military based name of the group, and the reference to 88 which is white supremacist shorthand of Heil Hitler (H being the 8th letter of the alphabet), suggest that what might need to be done may involve violence. The fliers reference an Australian section on the neo-Nazi website Stormfront.org, a Facebook page referenced in previous fliers is no longer mentioned (and appears to have been removed by Facebook). An e-mail address provided by Google continues to be promoted. The other recent flier from Squadron 88 is much simpler and shorter. It makes no mention of Jews and appears to be targeted at immigrants. It praises Australia then goes on to ask “Why are we allowing non white migrants who do not like our culture and European way of life to live here??? ?” The falls into the trap the previous flier sought to avoid. Australia after all has an Australian way of life, not a European one. We may like our Pizza, but we are equally fond of our Asian takeaways and our sushi. We teach Chinese, Japanese and other Asian languages as electives in our schools, not just French, German and Greek. This is before one considers the ethic break down of Australia not only now, but historically. Many forget that Chinese immigrants, mostly heading to the gold fields, made up 7% of the Victorian population back in 1861. “Why are we throwing away our values and lowering our living standards??? ?” This is the typical anti-immigrant sentiment being spread in Europe. Again this has little relevance to Australia which has always thrived on immigration, the vast majority of which is legal and promoted by the Government. Let’s look at the stats. In 2000-2001 more than twice as many immigrants came from Asia as came from Europe, and stats from 2012-2013 show that over 18,000 people born in each of India and China migrated to Australia that year. This compares to a little under 12,000 from the United Kingdom. In both years, however, the country with the largest immigration to Australia was New Zealand (around 27,000 immigrants to Australia in 2012-2013). It seems very doubtful that New Zealanders are corrupting Australian culture, support for Australian Rules Football is by no means declining as a result of this immigration. As to living standards, Australia is well above OECD standards and given the stats above (some going back 14 years) immigration has clearly not damaged Australia’s living standards. In fact, at the end of 2010 Australia was ranked as having the highest living standards in the world. If anything this is an argument in favour of past positive policies towards immigration. 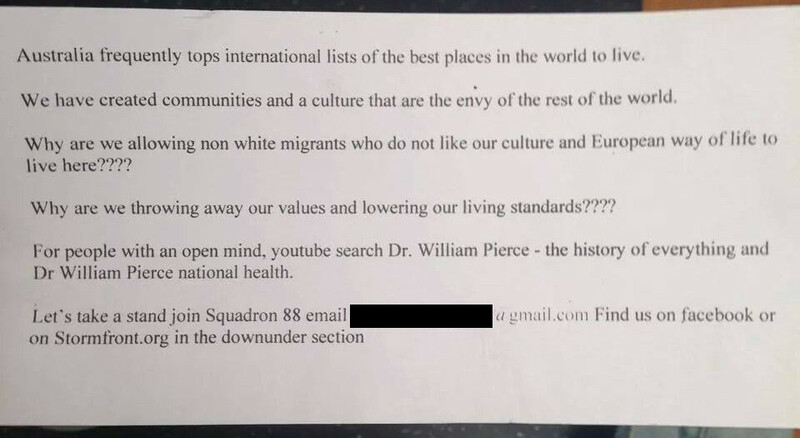 The flier went on to again recommend the writings of the former American neo-Nazi leader William Pierce and to promote Squadron 88 on Facebook, via e-mail and on Stormfront. The flier distributed last month included a range of well recognised far right antisemitic arguments. The flier went on to promote the work of William Pierce for additional reading. The Southern Poverty Law Center, a leading American civil rights organisation, describes William Pierce as “America’s most important neo-Nazi for some three decades until his death in 2002”. The importation of hate, particularly from the United States which holds such speech to be legal, is of serious concern not only to Australia but to other countries as well. Poor methodology in a Survey by the ADL has sought to hide the severity of the problem of antisemitism in America and the impact it has globally through the Internet. 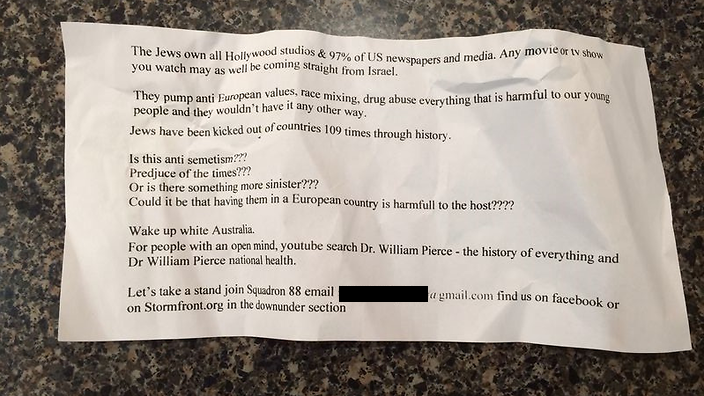 The flier references a Facebook group, provides an e-mail address and invites people to find them on Stormfront. It is through the internet that such hate is spreading across borders. On Stormfront one reader from Queensland agreed with the sentiment of the filers but warned “You should not say anything too affronting. Even if it is true. You can get away with anything on the net. But once you bring it to the mailbox it is better to be more tactful.” Another found Squadron 88 to be “embarrassing both yourself and us as White Nationalists… learn to properly write your own language. Those fliers are an absolute joke and have completely and utterly gutted your credibility”. Another cited the Anti-Discrimination Act 1977 (NSW) warning that the distribution of the fliers was illegal and that the Government may just like to make an example out of Squadron 88. Other National Socialist (i.e. 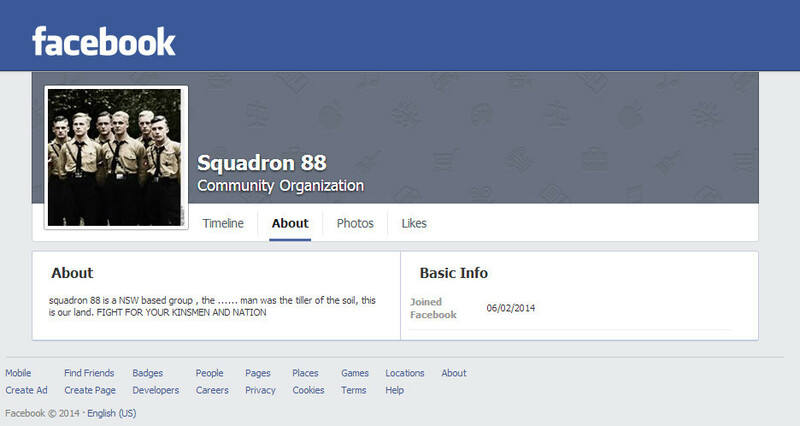 Neo-Nazi) groups are not happy with Squadron 88. The WhiteLawTowers accused them of not only reinventing the wheel but of going for a cheap reaction, they warned such an approach was “hardly a strategy. It is a recipe for disaster, a road many of us have travelled. A road that always ends the same”. Squadron 88 started with about 100 posters put up around Sydney as part of a recruitment drive in April 2014. The posters were soon spotted by ExitWhitePower, an anti-racism project supported by the Attorney General’s Department. 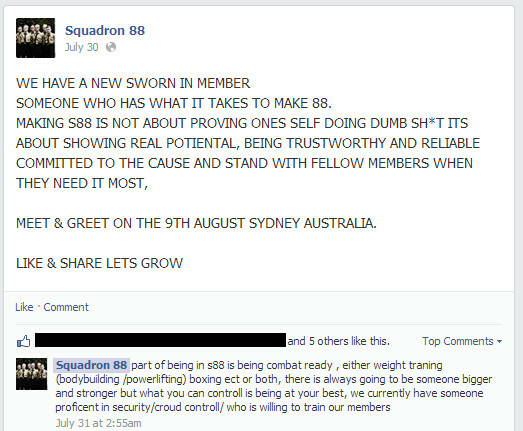 Squadron 88’s e-mail address “squadron88@mail.com” was used on the original posters but after this was apparently hacked (or so they claim) they started using a gmail account. The group is run by a Stormfront user with the handle “truewhitewarrior” who has been active on Stormfront since July 2013. Truewhitewarrior created a Facebook page on June 2nd, it grew to around 200 members before Facebook closed it on August 26th. The page was mostly a coordination point for in person meetings around Sydney. The Facebook content supports the idea that this is a group of thugs aspiring to be an Australian version of something like Combat 18. 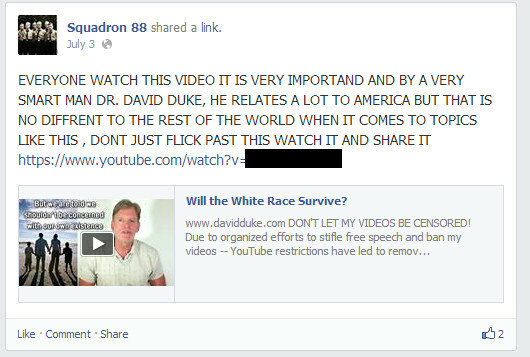 They promote David Duke, former Grand Wizard of the KKK. The say action is vital for the survival of the white race. 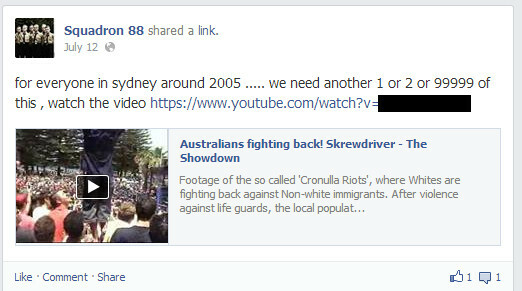 They call for further Cronulla Riots. Their aim is to make Australia a “place of purity”; this is the sort of genocide language right out of the Nazi playbook. Just for the removal of any doubt, they explain that “part of being in s88 is being combat ready”. A new Facebook page (ID: 1551590138393153) was created on September 2nd, but has only has 2 supporters at the time OHPI notified Facebook of the pages recreation and requested expedited removal. 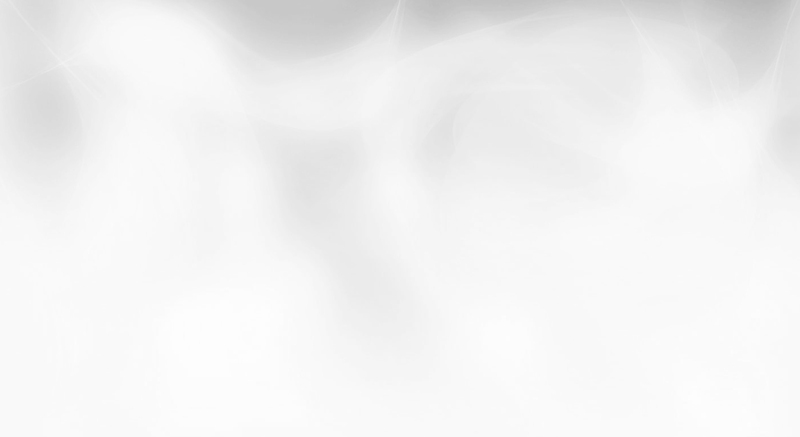 The page was swiftly removed (thank you Facebook). No doubt they will try again. Thank you to all who helped to report the page, to Facebook for their swift response, and to those who have been sharing this briefing. If you haven’t shared it yet, please do.